Star Wars is the most popular entertainment trading card franchise of all-time. Since Topps put out the first set in 1977, literally dozens of different sets have covered the films in almost every way imaginable. In recent years, autograph cards have been made of the top characters in the franchise, including Luke Skywalker, Han Solo, Princess Leia, Boba Fett and Darth Vader. Despite all the choices, a few notable options stand above the rest. View our complete database of Star Wars trading card sets. 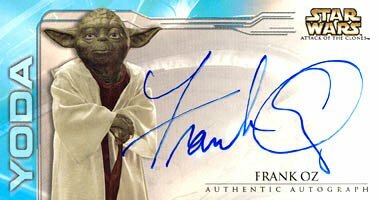 Because narrowing the list down among the many Star Wars sets is no small task, we have focused on the earlier years of the autograph production. As such, the list only incorporates the key cards from 2007 and earlier with a particular focus on the groundbreaking 2001 Topps Star Wars Evolution. 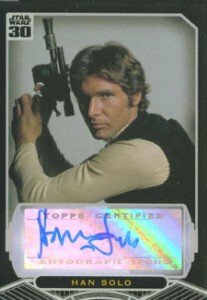 Starting with Harrison Ford, the following guide includes ten of the top Star Wars autographs put on trading cards. Shop for cards on eBay by following the heading or image links. Rumored to be limited to just ten copies, this card has sold for as much as $10,000. A notoriously tough signer, Ford finally came through and has appeared in limited numbers in other sets as well. The card features a classic pose of Han Solo holding up his blaster. 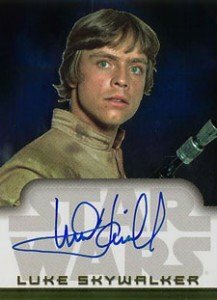 The key hero in the original trilogy, Luke Skywalker has been featured on multiple autographed cards thus far. Mark Hamill's first, and most popular, autograph comes from 2004's Star Wars Heritage. 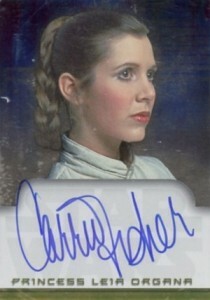 Carrie Fisher has been a relatively frequent signer for Topps' Star Wars sets. Her first, from 2001's Star Wars Evolution, was the rarest card in the first Star Wars set to include autographs. It was inserted at a rate of 1:3,577 packs. Despite the costume's iconic status, there's still no Slave Leia autograph depicting Fisher in her slinky bikini as Jabba the Hutt's prisoner. Anthony Daniels is a curious case. Known solely for a single role in which he is never actually seen, his autographed cards still command big dollars. Both Daniels' Star Wars Evolution and Star Wars 30th Anniversary cards can yield hundreds of dollars on the secondary market. Only a couple of prequel signatures make the cut on this list. 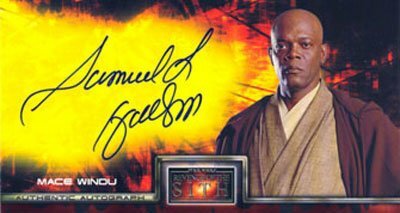 For Samuel L. Jackson, the popularity of his Episode III Widevision autograph is largely due to his overall popularity as one of Hollywood's most popular and active stars. The fact that it was inserted 1:2795 packs helps as well. Five years after the first Star Wars Evolution set was released, Topps went back to the concept and created an update set to encompass the prequels. 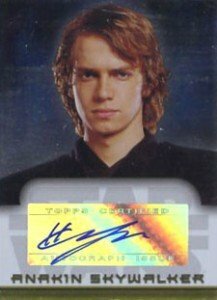 While the set was deemed a failure by many collectors, largely because many of the autographs were packed out damaged, one signed card proved to be a hit: an autograph of Hayden Christensen as Anakin Skywalker. The card was inserted 1:4010 packs. 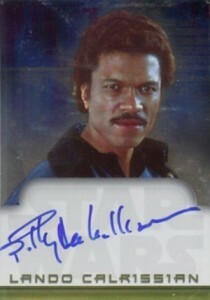 Another card from Star Wars Evolution, Billy Dee Williams was one of the toughest cards to find in the set. 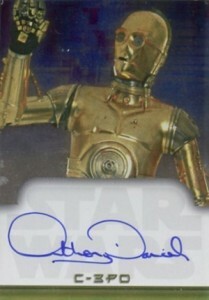 The hundreds of dollars it sells for is a testament to the importance of the Star Wars name on a card, as more recent Williams autographs go for a fraction of the price. Like Anthony Daniels, James Earl Jones is one of the few people on this list not to appear on-screen. However, his deep voice helped make Darth Vader one of the greatest movie villains of all-time. 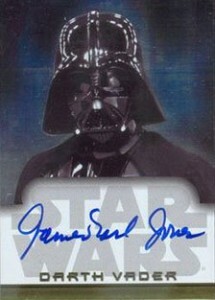 Although Jones has signed for other sets, the rarity of his Star Wars Heritage signature makes it the most valuable and it also features the same design as the 2001 Evolution autographs. Yoda is one of the most beloved characters in all of Star Wars, but Frank Oz has also touched millions by bringing characters like Grover, Miss Piggy and Fozzie Bear to life. While the Episode II Widevision set is loaded with autographs, this one is the best. Ian McDiarmid is one of the only actors to appear in the first six Star Wars films. He began as the nefarious Emperor, the puppet master of the Dark Side. In the prequels, he was still pulling the evil strings, although it wasn't quite as obvious. 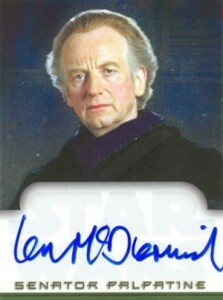 McDiarmid's Star Wars Evolution autograph is his first signed card, solidifying the overall value and appeal. 2018 STAR WARS ARCHIVES SIGNATURES MADS MIKKELSEN GALEN ERSO AUTO SP # 33 RARE! !